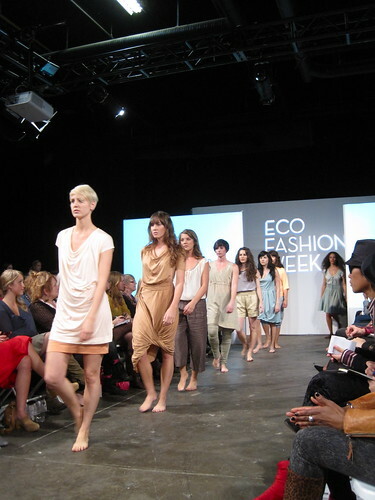 2011 Eco Fashion Week: Nicole Bridger's "Allowing Grace" fashion show at W2 Storyeum on October 6, 2011. Written and photographed by Christina Luo. Acclaimed Vancouver sustainable designer Nicole Bridger launched her spring/summer collection line with a runway show that synthesized music, dance and fashion presented by Rowenta last week. The contemporary dancers featured moved beautifully to the soothing rainy day tones of Bon Iver wearing Bridger's signature silk garments. 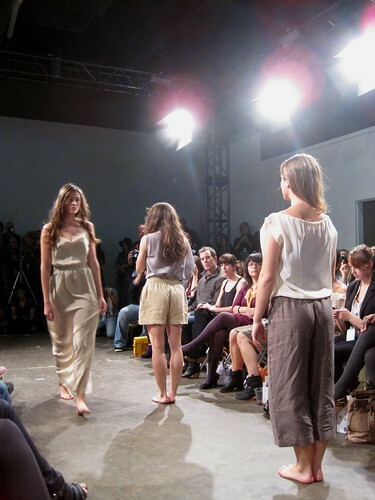 Fresh-faced and barefoot models floated down the runway in between (and during!) the dance performances. The pastel palette highlighted both the environmentally friendly focus and the far-off anticipation of spring. Dusty beige blazers and earthy sage dresses complimented the wispy shapes of each piece, all adorned with a label that reads "I Am Love." An elegant and moving fusion of sound, movement and style, "Allowing Grace" was truly a work of art that transcended your typical fashion show. Thanks for the link love at the end of the post, Rick! You got some great photos from the show; it was too bad we didn't spot each other that night. That's because I was there in his place! ;) Glad you enjoy the photos! You captured a few gems as well.